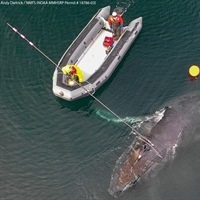 Unalaska uses teamwork and technology to save whales: Alaska Sea Grant assisted with an effort to free an entangled humpback whale. Morris Landing, a North Carolina Coastal Federation living shoreline site in Holly Ridge. Photo: Carter Smith. 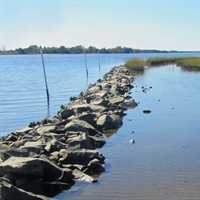 Living shorelines can enhance saltmarsh resilience to hurricanes: a Sea Grant-funded graduate student researcher found that living shorelines made salt marshes more resilient to Hurricane Matthew. 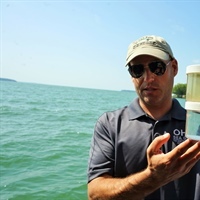 Ohio Sea Grant Extension Program manager Tory Gabriel holds up water from Lake Erie during a research cruise. 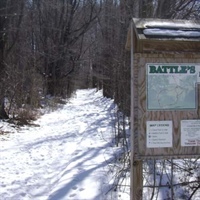 Low impact walking trail at Battles Farm, Girard, PA, one of the sites that will be preserved by Pennsylvania Sea Grant. Nature enthusiasts and wildlife to benefit from statewide investment: Pennsylvania Sea Grant and the Lake Erie Region Conservancy were awarded grants to conserve 270 acres of land, protect critical wildlife habitat, and provide over 6,000 feet of stream access for anglers. 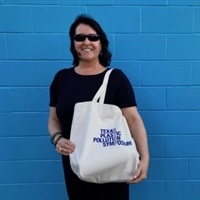 Dr. Pamela Plotkin poses with her reusable shopping bag. 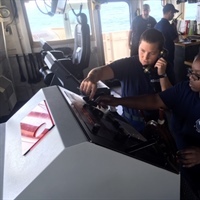 Graduate student interns learn how to collect, process, and finalize seafloor mapping data during USC Sea Grant's Mapppers-In-Training program. As waters rise, so do opportunities: Virginia Sea Grant participated in the sixth annual meeting of the Virginia Coastal Policy Center which opened with a discussion of the challenges facing Virginia and concluded with promises of action from Governor Ralph Northam, who signed an executive order to increase the state’s resiliency. 2019 NMFS-Sea Grant Fellowship: The application process is now open for the joint NOAA National Marine Fisheries Service (NMFS)-Sea Grant fellowship. These fellowships are available to graduate students enrolled in Ph.D. degree programs at academic institutions in the United States and territories. Interested applicants should check out the NMFS-Sea Grant Fellowships page. Special projects announcement: Sea Grant, NMFS, and the NOAA Office of Education anticipate funding a cooperative agreement to develop one or more Undergraduate Population and Ecosystem Dynamics Workshops. Applications are due January 23, 2019, and an informational webinar will be held December 18, 2018. More info. Applications for the 2019 NOAA Coastal Management Fellowship Program are due to Sea Grant programs by January 18, 2019. More info.